Beacons are hot. Once dismissed by many, they are now being widely deployed in retail and grocery stores, stadiums and entertainment venues. Apple’s support for Bluetooth (iBeacon) has put the technology on the map and driven its growing adoption. While many people have read about iBeacon, they don’t clearly understand what beacons can and can’t do. 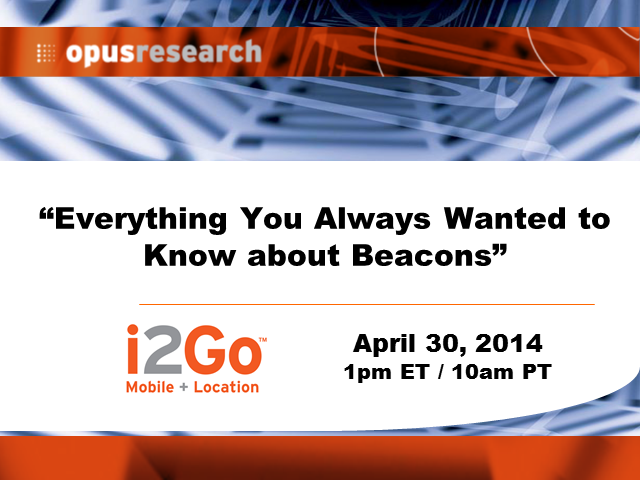 Join Opus Research Senior Analyst Greg Sterling and Steve Hegenderfer, director of developer programs at Bluetooth SIG, for an informative and interactive discussion about all things beacon. Bluetooth SIG is the group that oversees the standards and licensing of Bluetooth. We assure you Hegenderfer will speak plain English during a presentation aimed at marketers, agencies and business decision-makers.